October 31, 2015 – Relive the story of the Apollo XIII mission and meet its heroes during an unforgettable evening. 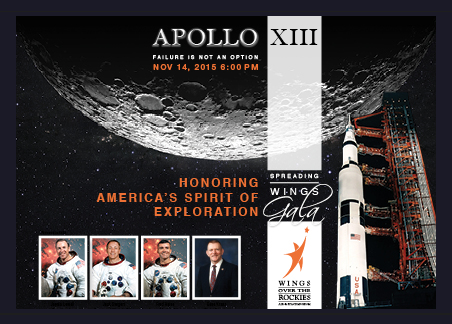 Wings Over the Rockies Air & Space Museum will welcome the original Apollo XIII crew and Flight Director Gene Kranz as guests of honor in this year’s Spreading Wings Gala on November 14. After an onboard explosion of the oxygen tanks, the Apollo XIII crew members were confronted with the grave possibility of never returning to Earth. The team raced against the clock to find a way to get back on a free-return course to Earth while facing a dwindling supply of food, water and power. Now you can hear about one of NASA’s finest hours in overcoming challenges from the people who lived it. It’s a story that will reaffirm America’s destiny to explore as NASA embarks on its journey to Mars. The evening features cocktails, dinner, an awards program, and an auction. There will also be video tributes from NASA and the International Space Station. Several local astronauts will attend this year’s gala in celebration of the Apollo XIII mission and to support the museums’s mission: Susan Helms, Joe Tanner, Ron Sega, Steve Lindsey, Jim Voss, Duane Carey, Dom Gorie, Lee Archambault, Jeff Ashby and Loren Shriver. The Wings Over the Rockies Air & Space Museum is dedicated to educating and inspiring people of all ages about aviation and space endeavors of the past, present and future. Tables and tickets for the Spreading Wings Gala are available for purchase online until Saturday, November 7.